Elucidating the contribution of GTPase activity to mutant LRRK2-induced neurodegeneration in Parkinson’s disease. in Parkinson’s disease (PD) using new transgenic mouse models. In June 2014, Dr. Nguyen joined the Moore Laboratory at the Van Andel Research Institute as a postdoctoral fellow. 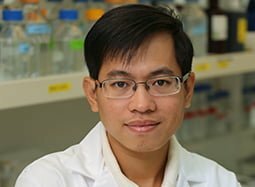 His research in the laboratory is focused on understanding the cell biology and pathophysiology of LRRK2 and in particular, the role of enzymatic activities of LRRK2 in mediating neuronal damage and neurodegeneration in vivo. Mutations in LRRK2 gene are the most common found in PD. LRRK2 encodes a large, multi-domain protein that possesses two major enzymatic functions, GTPase and kinase. The abnormal enzymatic activity of LRRK2 has been associated with cell death. However, the exact mechanism of how these activities cause cell death remains unclear. Understanding the normal function of LRRK2 is believed to be the key for developing new therapeutic strategies for treating PD. In this project, we propose to comprehensively explore the role of LRRK2 GTPase activity in mediating neurodegeneration in vivo. We will determine 1) the impact of increased GTPase activity on mutant LRRK2-induced neurodegeneration and 2) the impact of genetic and pharmacological disruption of GTP binding activity on mutant LRRK2-induced neurodegeneration in the adult rat brain. We will utilize a novel technology using human adenoviral vectors to produce LRRK2 expression in the rat brain. This approach was developed in our laboratory to identify and validate mechanisms of LRRK2-mediated neuronal degeneration. For the specific purpose of these studies, we have introduced synthetic mutations into LRRK2 that can enhance GTP hydrolysis activity or disrupt GTP binding of the LRRK2 protein. These studies will have important implications for understanding the molecular mechanisms of LRRK2-mediated neurodegeneration, and in particular the specific role of GTPase activity in modulating LRRK2-induced neurotoxicity. These experiments will validate whether GTPase activity could be a valuable target for the development of novel therapies for treating PD.